Battery operated Emma that loves to sing and run around. Put the colorful eggs in to see her walk and cluck. Hear the funny sounds she made as the egg is laid. Method: Press the blue heart to hear Emma cluck and sing. Then observe if your child moves her head or gaze to follow the sounds. This trains her listening skills and attention. Method: Emma comes with four colorful, plastic eggs. Encourage children to grasp the eggs with both their right and left hands. 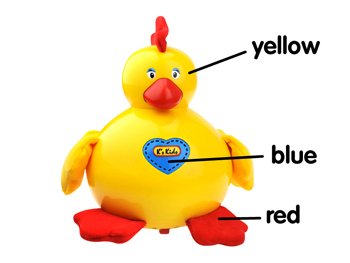 Method: The hen is made from different materials such as soft fabric, crinkle paper and smooth plastic. Encourage your child to touch and feel the different materials. 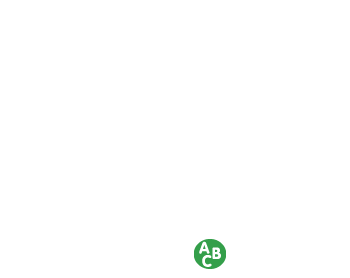 Method: Encourage children to hold the eggs in their hands and to shake them like rattles. They all make different sounds. Method: Place an egg in Emma so that she plays music and moves forward. Then encourage your child to crawl after Emma. Method: Activate the music in Emma by switching her on at the bottom. 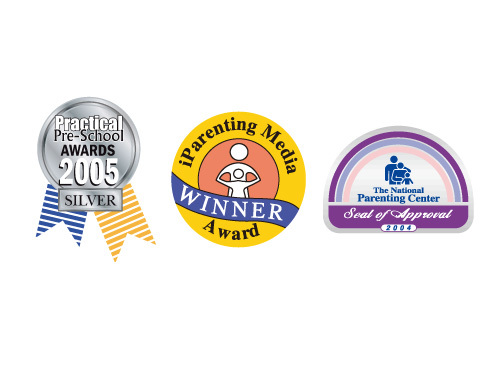 Encourage your child to listen and clap in rhythm to the music. Music cultivates positive emotions. 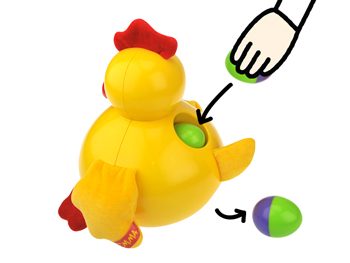 Method: Encourage children to roll the four colorful eggs across the floor. 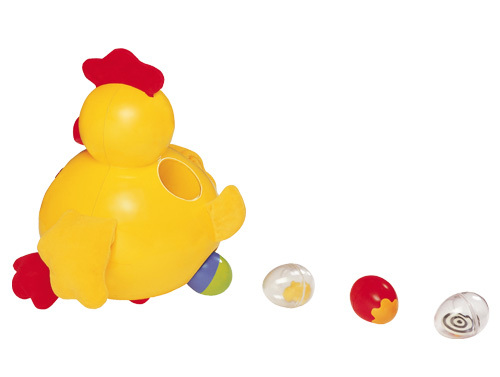 The moving pieces in the clear plastic egg attract children’s attention. Method: There are wheels at the bottom of Emma. 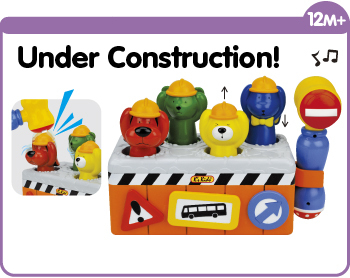 Encourage children to push Emma across a smooth floor. 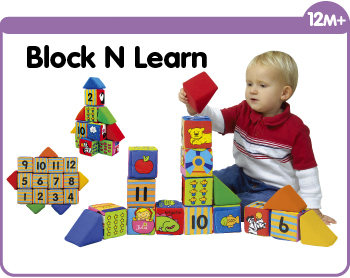 This trains their gross motor skills. Method: Switch Emma on. Encourage your child to place an egg in Emma. 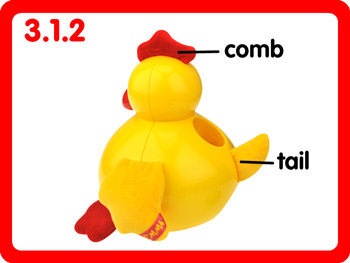 This will make Emma start walking and clucking, attracting your child to crawl after her. After walking a short distance, Emma will lay the egg. 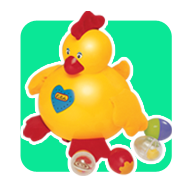 Your child can place the egg back in Emma to continue playing.This trains your child’s eye-hand coordination and gross motor skills. 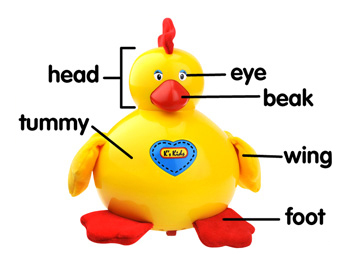 Method: Use Emma to teach children to recognize body parts and facial features. Method: Say a body part or facial feature and encourage your child to point to it on Emma. 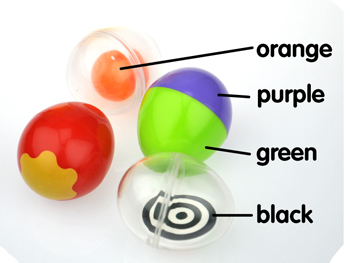 Method: Use the different colors of Emma and the eggs to teach children to recognize colors. Method: Say a color and encourage your child to point to it. Method: When your child starts learning to walk, place an egg in Emma so that she moves forward. Then encourage your child to walk after Emma. Method: Teach your child the concept of cause and effect by switching Emma on, placing an egg in Emma, and then watching her lay the egg. 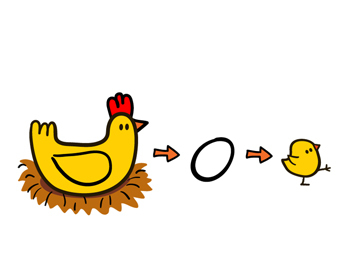 Method: Teach your child that mother birds lay eggs and that baby birds hatch from eggs.